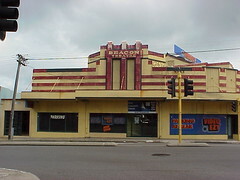 This is the former Beacon Theatre on the corner of Wray Avenue and Hampton Road in South Fremantle. The theatre was built in 1937 and designed by architect Samuel Rosenthal. As you can see it was a video store when I visited several years ago and at some point before that it was converted into a supermarket and run by the Stammers family. The building is classified by the National Trust and is a landmark in South Fremantle. The architectural design and colours must have been extremely impressive in 1937. Imagine dressing up on a saturday night to go to the pictures for the big night out! The building is looking a bit ragged 70+ years later - but not beyond the owners' ability to renovate. Yes Hels, it would be lovely to see it restored. I agree Anon. For what I know of theatres in Melbourne there were progressively closing from the 1950s onwards so it is not just a recent occurrence. The Sun Theatre is the Melbourne suburb of Yarraville is a wonderful story that has bucked the trend and after lying unused for quite a time it has tastefully been made into a multi-plex (using the names of the other former cinemas around the area) and has revitalised the whole precinct around it with bookshops, cafes and designer goods sitting alongside the old bakery, small supermarket & butcher. It is a very popular area now. You can see my posts about The Sun here.